Like Chicago’s resident Japanese-American master, Michiko Itatani, Keiko Hara was born in Asia and has enjoyed a long, productive career in the United States. But unlike Itatani, Hara carries more of the Shinto than the Buddhist tradition, as her paintings echo the abundance and resilience of nature. Murkiness and drippiness are her special delights. Unlike an Ab-Ex superstar like Cy Twombly, the apparently careless marks affirm rather than challenge an aesthetic of order and balance. Isn’t it more satisfying when the acrobat actually manages to stay aloft on the shaky tightrope? Hara often uses repetitive shapes—circles are her favorite—to measure space across the canvas and separate surface from background, but their variations and pattern are way too lively to be called minimalist. Her images recall the haphazard fall of raindrops on a dusty window, except that they’re not chaotic, they’re perfectly composed, with a sense of the miraculous in each piece, whether small or very, very large. Water seems to be beneath, within or dripping through all of her paintings. 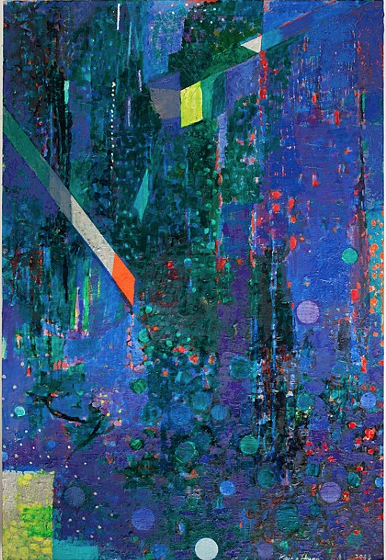 One large painting, “Verse Space—Ma and Ki—Violet,” feels like a rainy night in the city, with bright, colorful lights glowing through the moisture. As that title would suggest, Keiko is fluent with the empty space (“ma”) and undefined energy (“ki”) of Japanese aesthetics. Through October 25 at Perimeter Gallery, 210 West Superior.